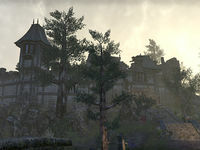 When Imperial Potentate Versidue-Shaie wanted a distant dungeon to house the most feared criminal and political prisoners of the Second Empire, he ordered a penal institution built on the coast of Black Marsh; it was named Blackrose Prison after the ancient city a day's march to the north. 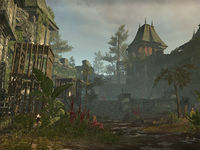 Blackrose Prison is a group-based arena in Murkmire. Cleansing the Damned 10 Have a single group member successfully absorb at least three of Drakeeh's targets during his Spirit Ignition ability and cleanse themselves without dying. Meteor Mayhem 10 Use Battlemage Ennodius' Meteor ability to stun all four atronachs simultaneously in the first arena of Blackrose Prison. Rise of the Fallen 10 Use a Sigil of Resurrection in any arena to revive three other group members at once in Blackrose Prison. A Thrilling Trifecta 10 Defeat Battlemage Ennodius, Tames-the-Beast, and Lady Minera within 20 seconds of each other in Veteran Blackrose Prison. Blackrose Buccaneer 50 Defeat Battlemage Ennodius, Tames-the-Beast, Lady Minara, and Drakeeh the Unchained in Veteran Blackrose Prison in under 40 minutes without dying. The timer starts when the first arena begins. Faster than Flames 10 Defeat Battlemage Ennodius without group members taking flame damage while her Flame Spouts ability is active in Veteran Blackrose Prison. Gauntlet Gallop 50 Defeat Battlemage Ennodius, Tames-the-Beast, Lady Minera, and Drakeeh the Unchainedin Veteran Blackrose Prison in under 30 minutes. The timer starts when the first arena begins. Rarely Rooted 10 Defeat Tames-the-Beast without a group member becoming trapped by the Crushing Roots ability in Veteran Blackrose Prison. Sigil Stingy 50 Defeat Battlemage Ennodius, Tames-the-Beast, Lady Minera, and Drakeeh the Unchained in Veteran Blackrose without using Sigils during combat. Skeletal Summoning 10 Defeat Lady Minara after three Bone Colossi are summoned within 30 seconds of the round beginning in Veteran Blackrose Prison. Spirits Sundered 10 Defeat Drakeeh the Unchained while always ensuring he absorbs at least 2 spirits before casting Spirit Scream in Veteran Blackrose Prison. Unchained and Undying 50 Defeat Battlemage Ennodius, Tames-the-Beast, Lady Minera, and Drakeeh the Unchained in Veteran Blackrose Prison without dying. This page was last modified on 7 February 2019, at 07:32.